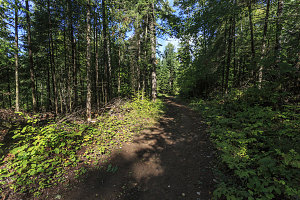 Today's hike involved a visit to something relatively local, but also something new: The Griffith Uplands Trail, a recently-constructed trail through the rolling hills and uplands near the town of Griffith, Ontario, about an hour and forty minutes' drive west from the heart of downtown Ottawa. 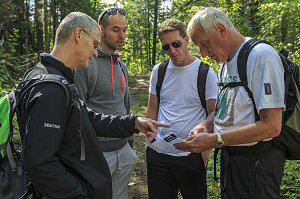 The hike was led by Frans, an organizer of a local Ottawa hiking group with which I sometimes go on outings. 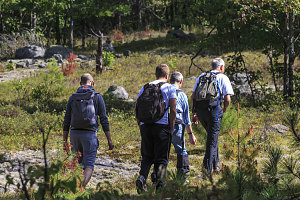 Also along (in addition to myself) were Glenn (also a co-organizer of the hike), and new hikers Jeff and Jacques. 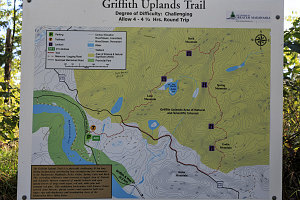 The Griffith Uplands Trail is a loop hike that climbs along a ring of low hills and ridges near the tiny community of Griffith. 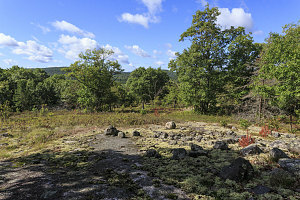 Even though the elevation of the trail never climbs above 1300 or so feet of elevation, there are many sections of very open, dry mixed forest, along with stretches of lichen-covered open bedrock. 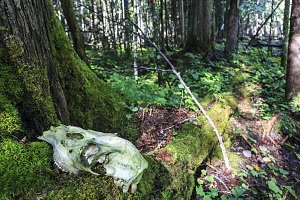 The trail is described as being a strenuous 10km loop. As we were to find out, that distance (and the designation of strenuous) are perhaps a little off. Seeing as this hike was only advertised as being 10 kilometres long (i.e. 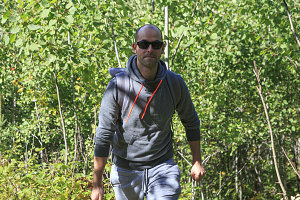 relatively short), we met at the relatively relaxed hour of 8:30 a.m. in downtown Ottawa, where we pooled into two cars and began the drive west towards the hike. 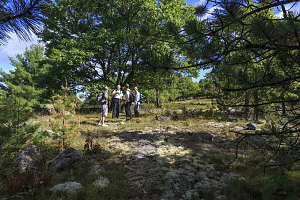 After a very rainy and stormy Saturday, this Sunday morning had dawned sunny and cool - perfect for hiking. 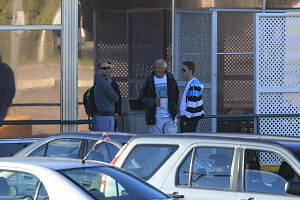 We arrived at the town of Griffith roughly around 10 a.m. Immediately before reaching the bridge that crosses the Madawaska River, we turned right off of highway 41 onto Hyland Creek Road. This we followed for just over two kilometres, before reaching the prominently-signed Griffith Uplands trailhead on our right. Hopping out of the cars and getting our hiking gear in order, we started off by 10:30a.m. 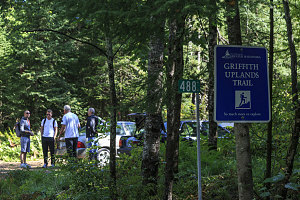 The Griffith Uplands trail is quite new; it was first cut and blazed in 2010. 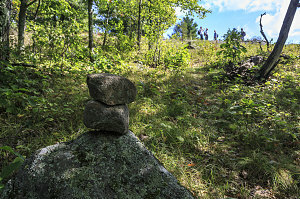 It is marked with a combination of orange flagging tape, blue paint blazes on trees, and, where needed, with cairns. 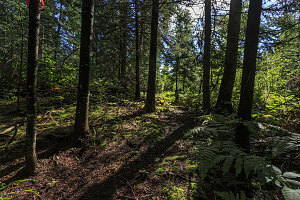 One could definitely tell that not many people had yet used the trail, for the tread underfoot was still mostly springy turf and forest floor. 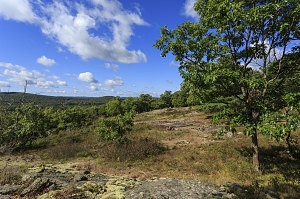 The main attraction of the Griffith Uplands trail is the traverse atop the low hills north of the town of Griffith. 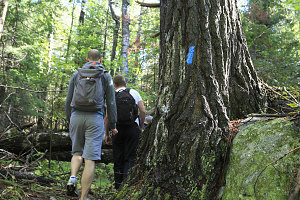 To reach the base of these hills, the trail first cuts across an area of lowland forest in the Madawaska river valley. It was well-cut and maintained (and easy to follow) throughout this section. 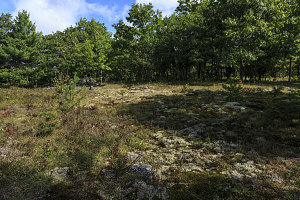 Very shortly, we arrived at a multi-use (ATV and snowmobile) trail. 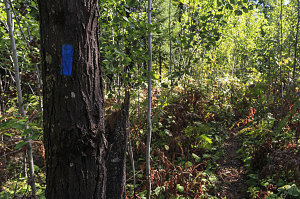 Here we had a choice, for the ATV track marked the beginning of the loop portion of the hike. 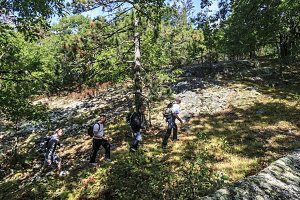 Going counterclockwise means that you have to walk for a kilometer and a half along the ATV track before veering off uphill; going clockwise means that you cross the track and immediately begin ascending the first of the hills along the trail. We felt like getting up sooner, rather than later, so we chose clockwise. 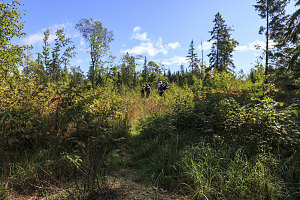 Crossing the ATV track, we followed the Griffith Uplands trail, and as advertised, it did in fact immediately start to climb. Our first destination of note was Lake Mountain, a 1250-foot (375-ish meter) high hill just to our north. 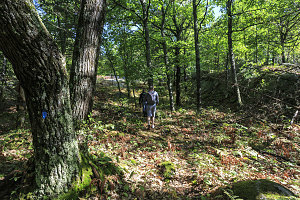 Although Frans had already scouted out this trail before and had told us of its virtues, it was still a pleasant suprise when, very soon (perhaps within five minutes of climbing), the forest changed character entirely, turning into a beautiful, spacious open woodland, dominated by oak trees. The trail's tread became very hard to follow, but this was compensated for by the many blue paint blazes and small rock cairns. 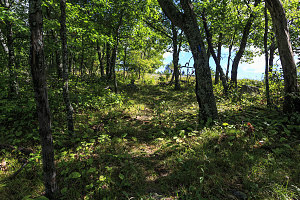 After perhaps a hundred feet of elevation gain, we reached the first of several scenic lookouts; limited at first, and then with increasingly-better views. 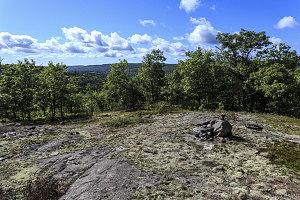 A total of two hundred and fifty of elevation gain (less than 100m) brought us to the main lookout near the top of Lake Mountain, where we had our first good look at the gentle Madawaska River valley below. Most pleasant. We stopped for our first snack break here. We were now on the Griffith Uplands proper. 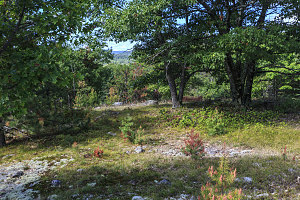 From here, the trail headed roughly north-east, following through either open glades or across sections of open bedrock and patches of lichen. 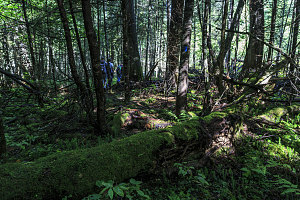 It was again obvious that very few people have hiked this trail, for in places there is absolutely no tread, and care was required to ensure that we did not veer off of the marked route.